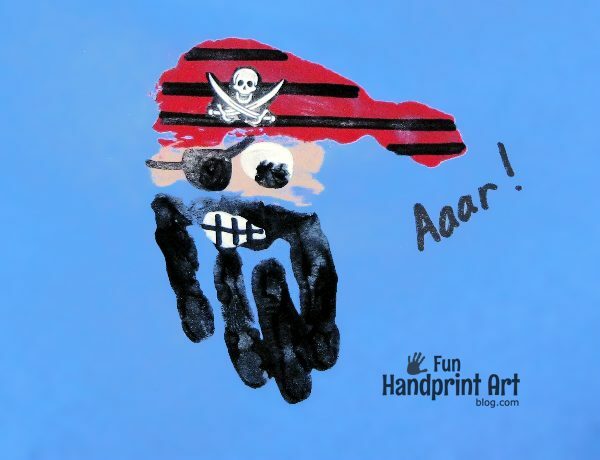 My son and his buddy made Handprint Pirates the other day- both boys love pirates. It is easier to make than it looks! I was inspired by a design I saw on the Making Learning Fun website. First, get black red, and peach (any skin color) paint ready along with 3 different brushes. Paint thumb and bottom of the palm red- this will be the bandanna. Paint the middle of the palm with the paint you chose for the skin color. Paint all 4 fingers black and dab some black paint on the top of palm just above the fingers. At this point, I usually look and quickly repaint the areas again if they look like they are drying already. Firmly press down on to the middle of a piece of paper. I usually have my son count to 5 or 10 and then have him lift his hand up. Paint thumb white and press down to make an eye. Paint pinkie finger black and press down on top of the white thumbprint. When it has finished drying, draw or paint on black stripes, an eye patch, and the details for the mouth. I did a search for pirate skull clip art and printed it, as well as a couple more for the pirate ship snack you see below. I used the option to print as contact paper. Glue the skull on the bandanna. 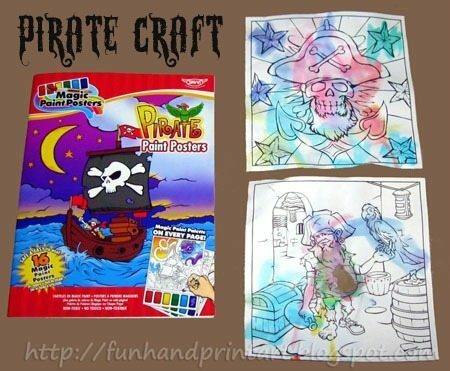 I bought the boys Pirate-themed Watercolor Paint Books from Michael’s. Each page has it’s own mini watercolors. These books are fun to take on the go. We used our smaller bug ones that I bought from Dollar Tree to take on our vacation. 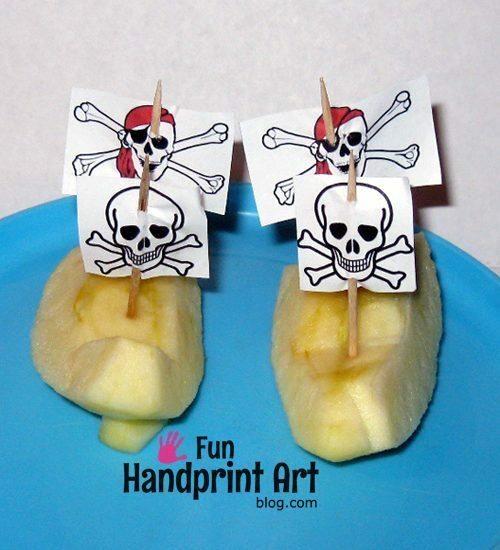 For a snack, I made Pirate Ship Apples! I printed skull clip art, cut them into a flag shapes, poked toothpicks through each one, and then stuck it in the apple. So simple, yet super fun! Those handprints are just so cute! This is so great! I know my lil&#39; pirate would love making these, thanks for the idea! 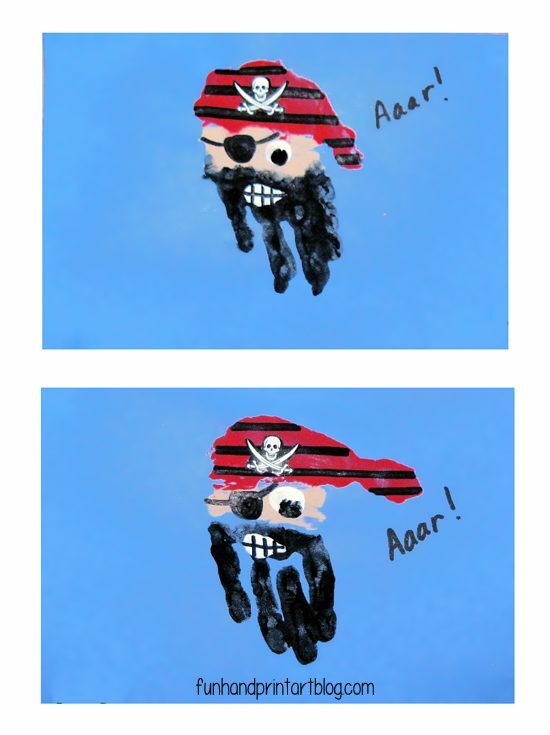 He sure does love pirates- cute idea! How fun! I love how simple the snack idea is yet it is very cool. So cute! JDaniel&#39;s best friend loves pirates. Just stopping by to let you know that I have featured your project on Fun Family Crafts today!